Austin Texas has gained a reputation for hip and laidback living. But this small southwestern Mecca has a diverse and growing community that includes as its backbone a furiously creative and innovative restaurant and hospitality industry. Good food is at home in Austin. So if you’re thinking about going to culinary school then look no further. A couple of the nationally ranked programs are right here plus a couple of distinct local schools that reflect the area trends. 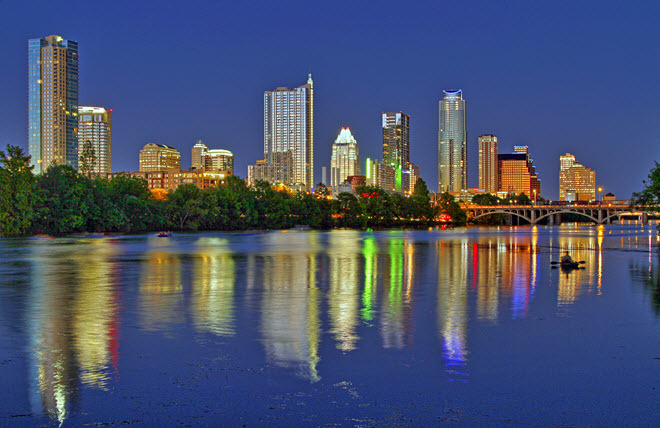 And if your passion is truly food then don’t miss out on all that Austin has to offer in the way of cuisine. Take the five and four-star restaurants in Austin: executive chefs – many quite celebrated – have earned their stripes for taking regional, clean and common ingredients and pushing them to the next level of sophistication, pairing them with equally common flavors- simple flavors to complex and layered flavors-- to make a truly distinct taste sensation. Restaurants run the gamut from Tex-Mex to five-star sushi, French, steak, seafood and wild game, and bistro style. Outside the executive chefs themselves consider the demands on the teams of assistant chefs, pastry and bakery chefs, kitchen prep cooks and wait staffs. Find out how to get the skills you need to jump into one of these excellent establishments. Austin culinary arts programs can teach you the skills you need AND help place you into a local kitchen job. The Texas Culinary Academy is home to the popular Le Cordon Bleu Culinary Program a partner with the French school of the same name. Le Cordon Bleu is one of the most well-respected programs and boasts a stellar alumni that spans the globe. Study toward a degree in Culinary Arts or Patisserie and Baking. You’ll learn the fundamentals of classic French and American cooking, how to portion food, hygiene and kitchen sanitation, management, cost control, and basics of international cuisines and flavors. Two campus restaurants are key components in student education—you’ll learn here in real world situations preparing and serving food to diners from the Austin community. When you graduate TCA helps you find work in the food service industry in an entry- or mid-level job. Small classes that launch at multiple times over the year characterize the spirit of the CAA. Students learn in intensive and hands-on situations under the tutelage of faculty and guest chefs. Earn a Professional Culinary Arts Diploma or a Pastry Arts Diploma, both of which last about 6 months. The feature capstones are externships you complete locally. This allows you the opportunity to work under the careful eye of local chefs and in popular and well-known restaurant kitchens. This unique culinary arts program is specially designed to provide novice and experienced chefs with the skills necessary to prepare and manage natural, vegan and macrobiotic diets and menus.